What about our water investigations? I thought I'd make this a "throwback Tuesday" - and share about the fun I had this past May with documenting the children's water investigations...I meant to do this many weeks ago, before the school year ended. Why not take a summer morning to share? If it is not documented, it didn't happen. extend the curiosity and motivation of the children, as they see their work valued and respected through this documentation. Obviously, a 'win-win' - curriculum and learning can only get deeper and more meaningful with this kind of engagement. I really wanted to try this - what would it be like to document for and with the children? 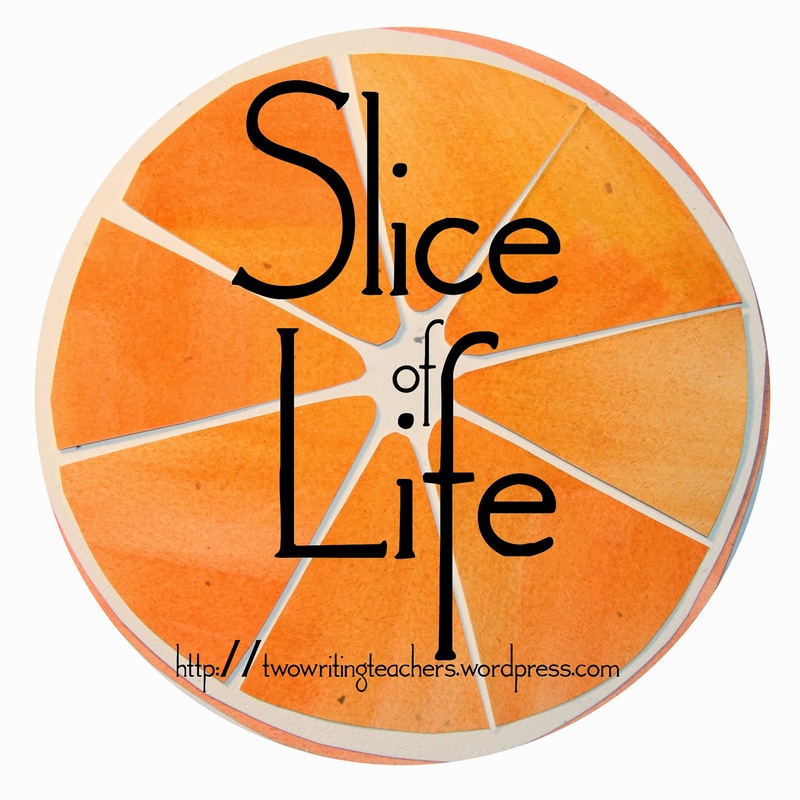 - not simply for myself and their families (as I do through this blog), but real-time, on-going, "let's see what we are learning" note-taking for the children to see. Our school follows a graduated release of teaching responsibilities, and by the end of the school year, the Resident is developing the curriculum and leading the class. My Teaching Resident, Melissa, was leading a water investigation unit. I realized that this was the perfect opportunity for me to try my hand at documenting - I was already in the supportive role of stepping back and observing, now I would take photos and notes and create an on-going, real-time record of the children's exploration. I focused on the students "wonderings" - What were their questions? What were they curious about? What did they want to know more about? I also focused on the teacher's goals - What did Melissa want to emphasize? What was the purpose of the activity? Why is it worth doing? One of the very first actions we took - creating a space for the documentation to be seen. We covered the front wall of our classroom with black banner paper, hanging an orange sign "UNDER CONSTRUCTION" at one end and entitling it "Our Water Investigations." Both children and families watched this documentation grow over many weeks, which sparked many conversations about the children's learning. To jumpstart our water exploration, we walked to Meridian Park and collected water samples from its reflecting pool. We talked about the waters we collected. How do they look? What do we see? Is this water clean? May we drink it? How did the water get in the pond? The students shared their wonderings about water – How do you know pond water is dirty? The students were adamant that the water was for ducks, fish, and turtles to drink but not for us. How did the water get in the pond? How is this water different from the water we drink? From other waters? How can we make the pond water clean? The students also showed an interest in drains. 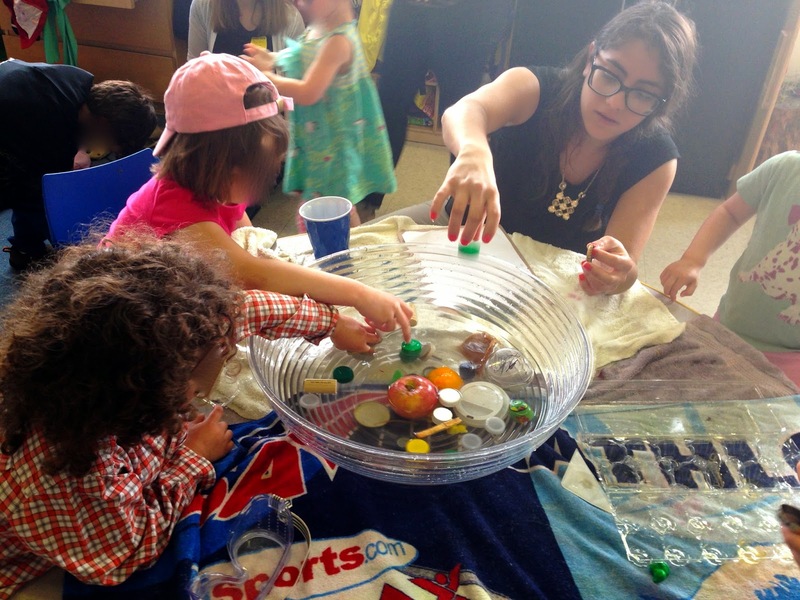 The water investigations incorporated all senses, all learning styles. Often during Gathering, Melissa would introduce various water topics to the whole group, spotlighting a specific experiment that would she would lead that day. In whole group, we did a lot of dramatic play. For example, the children traveled – via dramatic play – to a rainforest, ocean, and waterfalls, imagining each of these environments. We even danced in [pretend] rain. We recreated the sounds of a rain storm using our hands, thighs, and vocals. How do you know? What is wrong with this water? Why can’t I use it? What can we do to make it cleaner? Over the course of several weeks, during centers, Melissa worked with students in small groups. The children filtered water, separated mixtures, examined buoyancy, studied dissolution, and observed melting, learning a great deal about water properties. The children worked like scientists, developing hypotheses and testing these. They observed water in clear cups - What do we see? Feel? Smell? Hear? Taste? The students explored water mixtures with found objects (bottle caps, corks, metal pieces, rocks, beads) and food coloring. 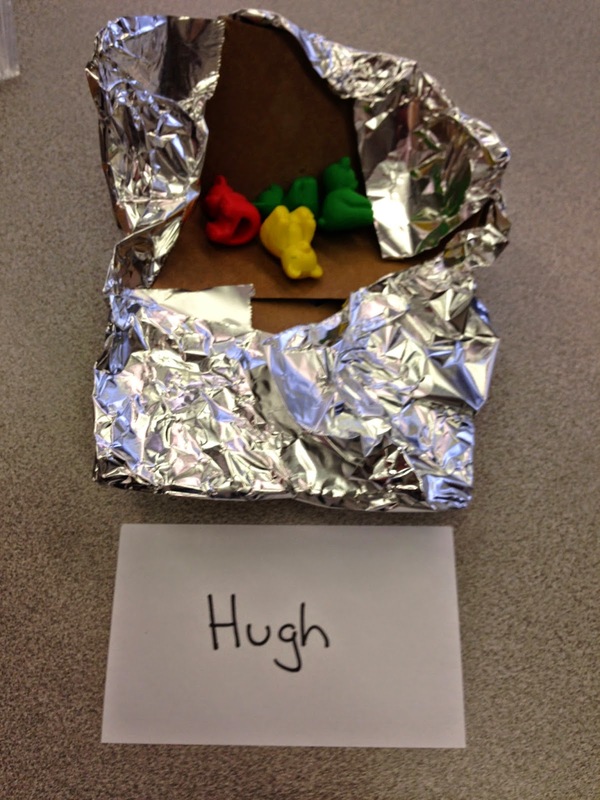 This lead directly to students wondering about “sink or float” – and continued experimentation with found objects. What sinks? What floats? Why? What is different? What is the same? Melissa wanted to introduce the children to the scientific process. Let me highlight one experiment - on dissolution. The teaching goal: Students will be able to predict, test, and observe what happens when water is mixed with another substance. They were particularly interested in the process of dissolving. Several mornings were spent mixing, stirring, and shaking a variety of materials into water. We used oil, food color, salt, cinnamon, pepper flakes, sand, and oatmeal. What happens? Does the material disappear? Does it grow? Does it simply swirl about? Does it sink? Does it float? Why might that be? What kinds of substances and materials dissolve in water and which ones don’t? For each experiment, students created a simple hypothesis. For example, do you predict this [salt, pepper, cinnamon, etc.] will dissolve in water? The students signed their name in the column that matched their prediction. [These children are developing excellent pre-literacy skills.] 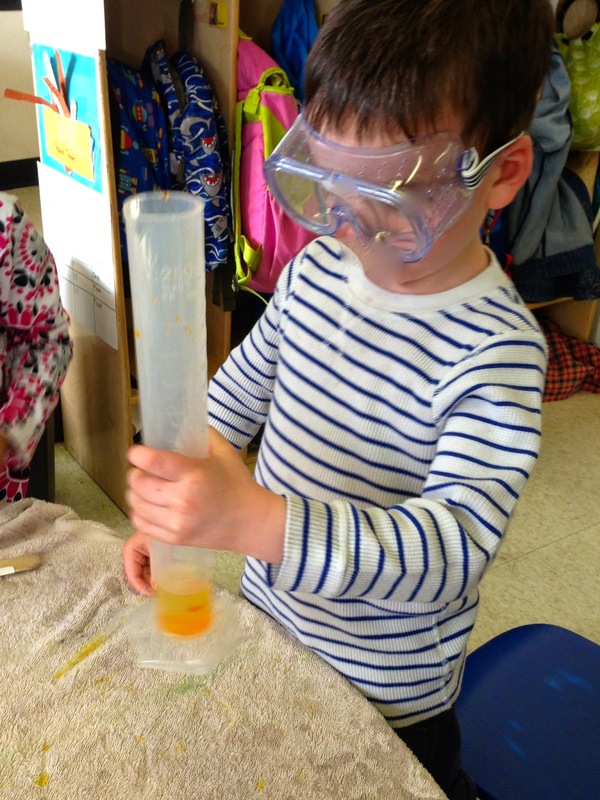 Then, the children would experiment with the materials and re-evaluate their original hypothesis. I was fascinated by how completing the hypothesis seemed to increase the children's engagement in the process itself - they wanted to repeat the experiment over and over, testing the results. 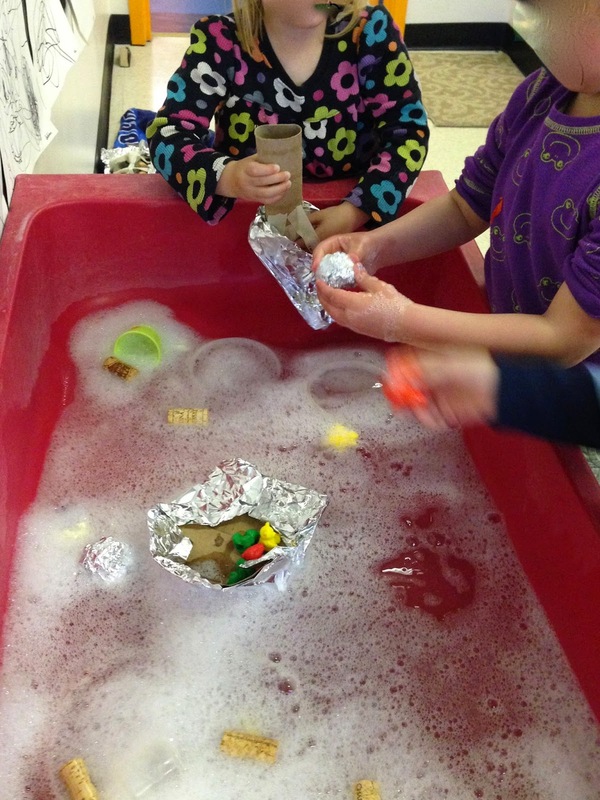 Over the six weeks of this unit exploration, there were water-related activities throughout the room, whether sensory table, blocks, dramatic play, books. At the writing center, the children practiced emergent writing and recall through written reflections on their experiments. We created a large "Word Wall" of new vocabulary from our experimentation. 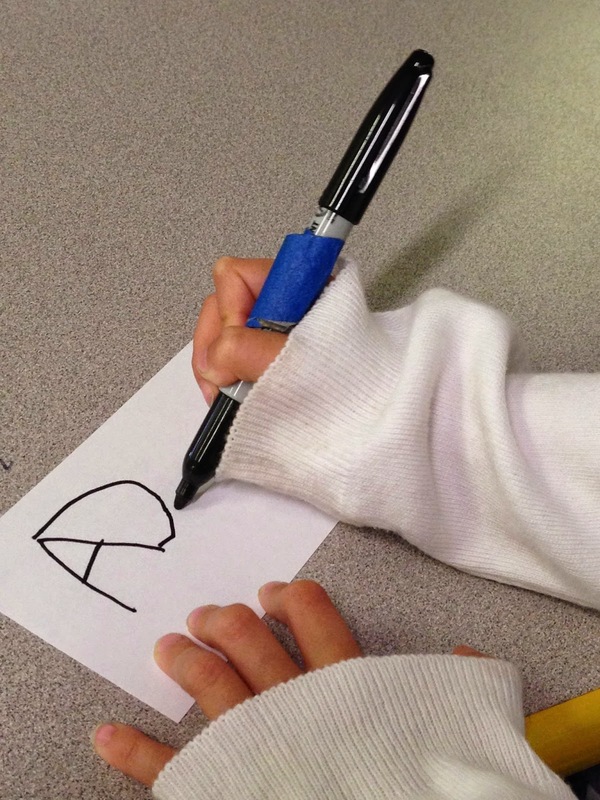 Preschoolers considered how words are spelled, sounding out the word and predicting its first and subsequent letters. (We observed students using advanced language, including dissolve, evaporate, disintegrate, investigate, melting, hypothesis, experiment, and predict.) We are cultivating an awareness about words, growing our vocabulary, enhancing our pre-literacy skills. We are cultivating writers! In the art area, we created a large boat out of cardboard. We painted with watercolors. We painted a large ocean mural, creating our own sea creatures for the display. In the dramatic play area, we dressed as scientists, wearing goggles and holding magnifying glasses. When the boat was completed, we played on the "USS Big Cats" (and we posted our scientific findings on this boat). Through several table-top games, we challenged the children's mathematical understandings. Melissa created one based on the Dr. Seuss’ story One Fish Two Fish Red Fish Blue Fish – Children match a numeric fish to a particular pond. There were also many extensions/variations to this game, involving counting and quantifying – How many fish total are in your pond? Can you collect fish numbered one to ten for your pond? Creating a boat in the block corner. Our challenge was to construct a bridge out of recyclables that was strong enough to support five toy elephants. Both boats and bridges were tested at the water table. Exploring evaporation by painting walls with water. Because we were documenting, lots happened!! Melissa's original unit plan was for approximately three weeks of lessons. However, the children became so engaged in their exploration, we ended up spending more than six weeks on this unit. 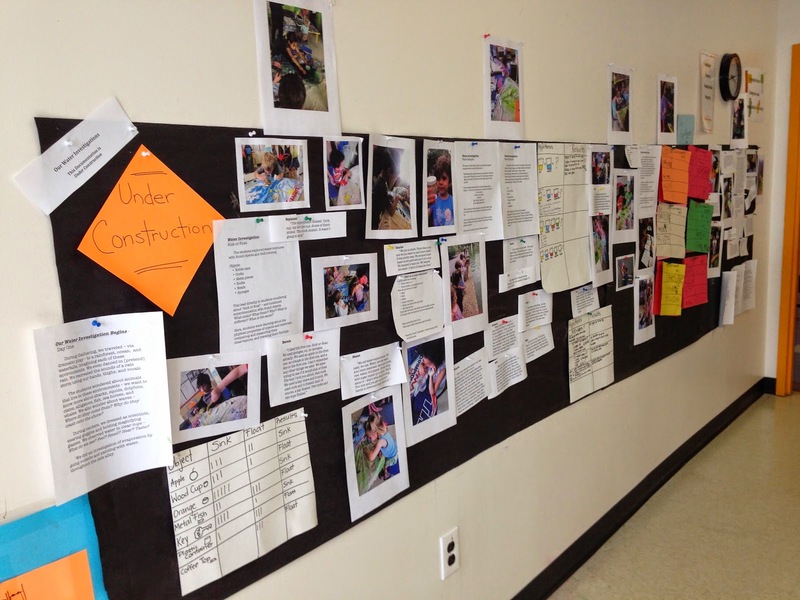 I believe the children's engagement was magnified by seeing their teachers' investment in the value of their work - as shown in our on-going construction of the documentation wall. When the children arrived at school in the morning, they would stop and look at the documentation and begin asking questions (a frequent question was - Can we do this experiment again?). We hadn't changed the way the classroom was structured or our daily routine; the room was still filled with individual choice and hands-on learning. What had changed, however, was the children's focus - documentation helped to highlight and delineate specific aspects of the learning and seemed to give the children a clearer sense of purpose to their play. They are thinking like scientists! I have no doubt that documenting our work helped to make our teaching stronger, offering clarity to both Melissa and me, helping us to plan better for the children's interests, spotlighting where our teaching was going well, and indicating what needed to change. Additionally, the documenting was a wonderful conversation starter for families, giving them a clearer idea of what their children were exploring and enjoying during the school day. How might I document on-going learning on a regular basis, not just at the end of the school year, when my Resident is leading the teaching? The frustrated preschooler - my elderly Dad!